Some years ago I bought two "normal" bicycles for my wife and myself. On a nice day, we headed out of town and down the highway. After some time, I turned to speak to my wife; but she was no longer in sight. I thought that she must have a flat tire or maybe the chain had come off. As I biked back, I saw her in the distance. Ah, her chain must have come off & she was resourceful enough to put it back on -- good for her. When I got within speaking distance, I asked if she had a breakdown. She said, "No, I can't ride as fast as you." A few weeks later, I saw an ad for a Gitane tandem for $200 and bought it. No matter how hard I pedal, she is always just behind me. A tandem bicycle is, by definition, a two wheel cycle which is designed to carry two or more people. The person in front is called the captain while the person in back is the stoker. Both parties must pedal in unison. In other words, the stoker cannot coast while the captain pedals. Sometimes we hear people call out, "Hey, she's not pedalling!" But the only time she does not pedal is when the captain also is coasting. Our favorite comment is: "Look, Mom, a double-decker bike." That might be true only if the stoker were riding on the captain's shoulders. If the stoker is inexperienced he/she can place complete confidence in the captain and not have to worry about shifting gears or traffic conditions. A blind stoker can feel the breeze and overcome his limitation in a way that he could never do on a single. Conversation between captain and stoker is easier than shouting between two singles or trying to avoid crashing into each other. As for speed, a tandem has the power of two people and the wind resistance of only one. My Gitane tandem weighs 40 pounds. That is 20 pounds for each rider. A 20 pound bike is considered a fairly lightweight bike. Tandems are also built with better brakes. Most have caliper brakes which clamp on the wheel; but they also have a drum brake in the hub of the rear wheel. Even in rainy weather when calipers may slip on the wet wheel, the drum brake will stop you. Good communication is necessary between captain and stoker. When encountering a pothole, the captain has the advantage of sitting in the middle of the frame. As the frame flexes, he gets the benefit of the springing action so that the bump is not nearly so severe. The stoker, however, sits right over the rear wheel. He gets the full force of the bump. It is the captain's responsibility to call out, "Bump!" so that the stoker can rise off the saddle. Signalling is done by the stoker in response to the captain's instruction. Lest you think this page is a commercial for selling you a tandem, let me say at once it is not. 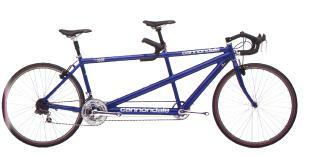 However, if you want to enhance your relationship with your spouse, riding together on a tandem may help. If both partners want to be in control, a tandem is not for them. The stoker has to submit to the leadership of the captain. Together they work in harmony. Although some conversation involves the mechanics of riding (e.g., "let's shift into a lower gear"; "I think the chain has jumped off the idler wheel. "), many other conversations take place. Let me appeal to your ego. If you want to impress others, don't buy a Corvette convertible. Get a tandem. More heads turn at the sight of our tandem than any other mode of transportation. Women pedestrians always smile at a man on a tandem. No one knows the reason for this phenomenon, but it is certainly the experience of many riders. I have heard many couples riding on singles say to their spouses, "Honey, we should also get a bicycle built for two."